The moment we saw these gowns at Market in New York I knew we had to have them in our shop. 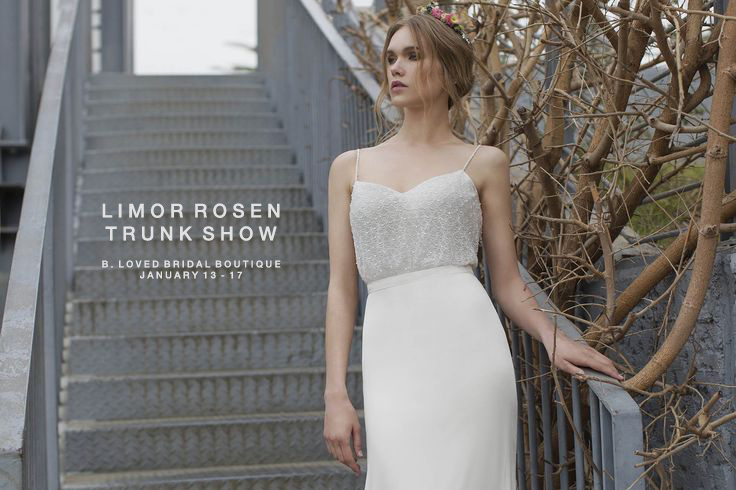 We are beyond thrilled to have Limor Rosen gowns at B. Loved Bridal for a trunk show January 15 – 17, 2016. Getting her started at Bezalel art academy, where she was given the freedom to relate to garments as works of art and not only as items of clothing. Studying fashion at the Instituto Europeo di Design in Madrid, she came in contact with the highest standards of the European fashion industry. After training later on as part of the design team of the Diane von Furstenberg fashion house in New York, she set up my own studio, Limor Rosen Bridal Couture, in the heart of the Tel Aviv gallery district. From their Flagship studio in Tel Aviv Limor Rosen creates feminine graceful designs. They use comfortable meticulous patterns, carefully selected fabrics, and uncompromising sewing. All these are implemented in creative work that pays attention to every small detail of the garment.